Recently the boards have been plagued by arguments of which is better the 327 or 350. Stekman and I both felt this would be a good idea, create one thread and get it all out and in the open. Perhaps we can end all of the pointless threads that get deadlocked in bickering. This thread isn't for proving someone right or wrong. Instead, it is to get all of the facts and opinions out there, so that people can make their own decisions. This should result in less arguments over it. The 327-350 argument has went on a long time here. They both have merits, and they both have myths surrounding them. Some of the more popular arguments are below. Hopefully this thread can keep us from having a new one started every other week. 1.High Revving. ---- In the racing world, where engines are going to sustain high RPM's for extended periods, it is possible to see an advantage to a 327 engine. It does have the advantage of the shorter stroke. This is also in a situation where both engines are built to exacting and equal tolerances. However, in a street engine, where the max RPM’s are still going to be under 8k, the stroke really is irrelevant. What dictates the ability to “rev” easily lies more in the valvetrain than in the stroke. The stroke may help in sustained high RPM situations, to an extent. The ability to reach those RPM's lies in the engines ability to effectively open and close the valves and move enough air through the engine. Basically an internal combustion engine is no more than an air pump. If the ability to flow the air is there, the ability to reach those RPMs is there also. 2. More Durable at High RPMs (ability to safely rev that high on regular basis) --- This is true and false at the same time. The shorter stroke does allow the engine to sustain the higher RPM in a “more safe” manner. However, contrary to common belief this will not be done on a stock 327 shortblock. The 327 does not have any magical composition that other SBC engines lack. Stock rod bolts aren't going to take it. The bearing tolerances have to be exact. Everything must be right. In essence, if you were to invest this same amount of time, money, and effort into a 350, you would yield the same results. 3. Many people associate a certain “aura” with the 327 engine. Many people here stories of dad, or grandpa, racing their “vette” with a 327 in it. There is no magic in an engine. It does not inherit the spirit of the vehicle it powered. An engine is an engine plain and simple. When rebuilt it becomes what you want it to be. It doesn’t matter that the 327 came out of a vette. Remember that same 327 powered the Impala too, hardly what you would call a screamer. 4. Some people refer to magical combinations. The 377 is one that comes to mind. Destroking seems silly, and most people agree. Really, that’s all a 327 is. A de-stroked 350. But, there is nothing magical about the stroke in relation to bore that makes it produce power on a scale that is greater than other SBC engines. It will make power in relation to its displacement, as all engines will. The 327 is not a worthless engine, even though some may call it that. Its not a waste of time either. It really depends on what you are doing with an engine, more specifically, what its intended use will be. For an engine that will be raced on the strip only, a 327 can serve the purpose. When you can do high RPM clutch drops or run a big stall, you can make up for the raised power band that is to be associated with the smaller bore-smaller displacement engine. Likewise if you are going to be doing 90% of your driving on the street, you want to keep the RPM power band lower, to be more effective. I am not saying that a 327 cannot have bottom end grunt. It most certainly can. As stated above, any engine can be built to be what you want it to be. But, proven fact does come into play here. IF you take the snarly, mean, and nasty cam out of your 350 and install it in a 327, it will be become even less friendly. It will have a more rough idle, and the power band will be pushed up higher. How much is up to debate, but 750-1000 RPMs higher is the norm. This is not preferable for a street engine, as most thirdgens are. In order to counteract this, you would need to install a less aggressive cam profile. This would of course lower the overall power output of the engine. This is the reason for the “No Replacement for Displacement” argument. Equal components in both engines, the larger displacement will prevail. This should not be mistaken for high revving ability though, this is simply a higher RPM power band due to the smaller displacement of the engine. This is open to be picked apart, and any facts, either in support or in disagreement with any of this is definitely desired. Post anything you got, lets get this done with, once and for all! Mostly true. I'd just like to bring up one thing that you seem to disagree with, and that's the rod/stroke ratio. Mr. Gasket, who designed Desktop Dyno and Dyno 2000 agree with you that they feel stroke has absolutely no bearing on power building or ability to rev. Their program also has other bugs that have no bearing to this topic (such as turbo programs that build no extra power with increasing boost, head designs that are over-simplified, and no difference between different intakes of the same design). The chief factor in higher rod/stroke ratios that makes it a power builder is increased dwell time at top dead center and bottom dead center. This increased dwell time helps to fill the cylinders more at top dead center and scavenge exhaust gasses more at bottom dead center. This has been dyno-proven to increase power over engines that get the same displacement using longer stroke, smaller bores, and poorer rod/stroke ratios. Another issue that you brought up is that on the street, it doesn't really matter that much as to which revs easier. And this I agree with. The extra inches in the 350 will make more natural torque than in a 327. It's only really an issue at higher rpms when you approach the limits of metallurgical fatigue. The longer stroke will have higher piston speeds for a given rpm, and will reach its connecting rod fatigue limits at a lower rpm than the shorter stroke will. There is one difference though, typically 327's as with the 302, 283 and 265 engines, had forged cranks from the factory. A lot of 350's didn't. Having a forged crank doesn't really matter for the street either, but it does help a street/race engine live under race conditions at the track. 327's have a different sound. I noticed that when I ran a 327 in my Corvette. It had a great engine note that sounded a lot like a Ferarri. When I put the 350 in it, the sound was deeper and throatier...it lost that quality. I liked the extra torque of the 350 to haul the Vette's 3200 lb heft around, but I really missed the voice of the old 327. What I should have done was keep the 327 and supercharge it, rather than replace it. Rockin-Iroc-- Good points on the forged crank and the increased dwell time. I was going to add that to the original, and still may. I have some DD charts to post, and a few people have been promising me some real dyno sheets, so I will get that stuff going as soon as I can get my grubby hands on it, and get it hosted. A shorter stroke engine has less side loads on the piston thus it will have less friction. Chevy never made a 4 bolt main 327. all 327s from GM are 2 bolts. If someone wanted to build a 327 they can use a 307 crank and have it balanced to a 327 if you have a large journal block. A small Journal 327 has a slightly better advantage over the 2.45 journal 327, in that the small journal has less friction. I beleive the majority of small journal chevy engines have forged cranks. If Im wrong please correct me on this. Last edited by 86 sports coupe; 04-13-2005 at 06:56 PM. The chief factor in higher rod/stroke ratios that makes it a power builder is increased dwell time at top dead center and bottom dead center. This increased dwell time helps to fill the cylinders more at top dead center and scavenge exhaust gasses more at bottom dead center. I believe you've got that backwards. Note to readers and potential posters: The purpose of this sticky is to document the technical differences between 327's (i.e., short stroke) and 350's (longer 3.48" stroke), so this sticky can be referenced when somebody starts a thread about this 327 that will rev to the moon that they can get a deal on to replace their current 350. It is not an opinion poll. I will edit and/or delete posts that are argumentative, opinionated, or are otherwise not contributing to this specific technical discussion. We really aren't interested (in this sticky) about your dad's cousin's friend's boss's uncle's '68 327 Camaro and how much faster it was back in 1971 than any 434 SBC you've ever seen. The Higher reving thing may be true in stock configuration but as already stated the stock rods and bolts etc. can't take those kind of revs anyway. When you build a RACE engine to rev there really is no difference between a 350 and 327. The thing that limits revs is reciprocating mass. The 350 crank rods and pistons can all be made lighter by a LOT if you drill out the rod journals and turn down the counterweights, use a light weight clutch assembly, clean up the rods and remove the excess balancing pads, profile the beams and shot blast them after to put the surface back in tension. Light weight pistons and wrist pins. If you do all of these things to a 350 it will rev like you won't believe. Just touch the throttle and the tack hits 7 grand like a rocket. At this point the valve train becomes the limiting factor in how high the engine will rev and how long it will live. Not the bore and stroke. is the shorter stroke. The reason a 327 will sustain the rpms ( Im talking factory engine) Is the shorter stroked engine will have less of a side load on the pistons. Its the same if you compare a 383 to a 350. The 350 has less friction on the pistons. The 327 has less side loading on the pistons compared to the 350. The hp levels will be close but the longer stroke engine will have a torque advantage over the 350. Both engines are good engines. If you hopped them up idenical and put them in the same car and you have the same traction the 350 equiped car would have the advantage. If it was a light weight stick shift car lets say a chevy II. then the revs of the 327 might come into play. In the end a longer stroked chevy will make more torque. The shorter stroked chevy will make the rpms. For the race track high revving engine you want a large bore short stroke engine. Yup, you're right. I got that backwards! I had the pleasure of having both a 327 and a 350 in my 68 Corvette once. The 327, I remember, was a sweet revving engine and made sounds like a Ferrari. I'm not sure why. That incredible sound did not transfer over when I put the 350 in. However, the 350 had noticeably better torque. But I didn't feel it revved as eagerly. The 350 was definitely a quicker motor in the slightly weighty Vette with tall gearing. I liked both motors. But now I've got a barely streetable 427 in the car. If I had it to do over again, I'd have kept the 327 and stuck a supercharger on it! I agree, both good motors. But how about a 377, made from a 400 with a 350 crank and 6" rods? Now THAT's a rod/stroke ratio! If I was going to build a hopped up track race engine, I'd try to build a 377. For the street, I'd go for the torque and probably build the 400. Definately with a stick shift the 377! I think the mystique of the 327 comes from the few High performance versions like the L79. Having a 300hp 327 in my first car (57 Chevy Belair) back in the mid- late 80s (with headers, a 350hp cam, and a 4 speed), I can tell you why people swear they were better/stronger than the 350s...they had good (for the day) cylinder heads. Most 350s on the street were low compression, with lousy smogger heads...a large number of 327s had the so called "double hump/camel hump/fuelie" heads, which contibuted to higher compression and were generally much better. Even the small valve (1.94/1.50) versions like mine would waste the average 350 on the street, since the average 350 then was, well, a dog. There were hardly any aftermarket heads then, and the ones out there (iron Bow Ties, aluminum Brownfields) were expensive. Today, you can go get a set of Vortec heads from a salvage yard and outflow the old doublehumps by a longshot. I loved my old 327 (still have it), but with today's choices I wouldn't build one except for a restoration or a period-correct 60s hot rod. Thats a good point. I would say up to 1968 alot of them did have the old double hump heads. In 1969 though I would say just the hi performance 327 got the higher compression heads. In the 70's, mostly you are correct. However, in 1970 when the 350 LT1 first came out, it was powerful. That was the good 350 to have. Immediately after that though, compression and power started to go down rapidly, and most of the 350's in the 70's were smogger motors with a lot less power than even the 300 horse 327's. To add insult to injury, Pontiac came out with the 455 just as 350's were dropping out of the race, and the Ponchos were king of the hill in the mid-70's. The 70's 350's though, often times had 4-bolt mains. At least the ones in Corvettes or for severe duty such as pick up trucks. Those are good blocks. Excellent cores for either modernized 350 rebuilds or a basis for 383 strokers. The 350 is a very good street engine. The compromise between torque, power, and economy is about the best you can get, with the exception of the latest generation 5.7 liters. I'd take a wheezy 4-bolt main low compression 350 Vette motor any day and rebuild it nice and strong...and probably stroke it for the torque. Good thing about the smogged out 70s 350 is there are alot of them. There are alot of unwanted 307 also. So if someone wanted to build a 327 they can use the 3.25 stroke 307 crank and smogged out 350 block and save the original 327s alone. To buy a 350 core, if I pull it myself, it's $128 at a local salvage yard. If I don't want the hassle, it's $500-$600 range if they pull it. Might almost be easier to buy one from a private individual or go to a swap meet. There isn't anything wrong with a 350. The extra torque can be advantageous, even for the strip. A pair of Vortec heads and an intake could make a short block a 400+ horsepower engine easily...albiet with maybe a modern cam swap. Over 400 horsepower on pump gas, for under $1000 invested, is not a bad return. Even if the motor needed freshening up, a 350 smog motor with some modern updates might almost be the best performance deal going. My IROC's 355 is a 4-bolt 70's engine with stock crank, rods, and even cast pistons. It was totally built on a tight budget, and it's got enough power to make almost everything disappear quickly in the rear view mirror. There's only a few modern street cars that can threaten it, (Cobra, C5/C6 Corvette, WRX-STi). And I guarantee I've got several thousand less invested than they do! Nobody's even addressed the asthetic advantage yet of the 327. 'Threetwunnysevun' sounds a bunch cooler than 'treefitty'. You should hear a 327 run. They really sound great. I know someone with a pump gas blown 327 in a shoebox that goes single digits. Don't see anything wrong with them. I've had 327s and 350s in my 69 camaro street car. I much prefer a 350. Yeah, lotsa of people talked the 350 down as a low performance smog motor years ago. Lower compression and more 2 bbl carbs. But, unless I'm building a 60s vette or an L-79 nova or something, I wouldn't go back to a 327. Much cam in a 327 and its goodbye torque, where a 350s torque will hang in there MUCH better with the same cam, making it much more drivable. The 327s offered instant revs, though, during burnouts or gratuitous wings of the throttle, and was therefore a little more impressive to the other goobers at the drive in. My current 350 is very light inside, though, and revs about as quickly. Anybody remember when the 350 hp 327 cam was the stick to have in your SBC street car? Chevy must have sold a jillion of them. Seems like everybody was running it in the early '70s. I think it used to be referred to as a purpleshaft because it had some spots of purple paint on it. if you feel torque is lacking down low, gear it lower lol. I am yet to see how any SBC can ever be accused of lacking torque. All these arguements about displacement just seem silly. Every displacement SBC hold maybe the 267 has seen single digits. It was all in the combination of parts for the particular engine, the gearing/stall to keep that engine in its powerband as much as possible during a race, and putting the proper engine in the proper car (small engine, higher RPM goes in a lighter car, etc.). Streetability is a non-issue when talking purely about engines. If it can legally be licensed and registered it's streetable. A fully built race motor, 327, 350 or otherwise will always be need to be stalled out to higher RPMs, but even off idle, they are making more torque than a honduh accord is at peak torque, so I can't see how it'd be less streetable to drive one than it would be to drive an accord since it'll get moving better off idle than a honduh will be once it hits 5000 rpm or where its peak occurs. Of course, if you half *** it, build a hot motor and put in a puny stall, or leave it stock, and keep highway gears, you're looking at a pooch until you hit higher rpms no matter where you drive it, street or track. Overdrive has made running around with 4.10, even 4.56 gearing a reasonable idea these days so getting off the line with a "buzz bomb" motor like a 327 shouldn't be a problem at all. If you truely want a fast car "streetability" in your terms is pointless. A fast car will not be an easy to drive, relaxing cruise; it's not supposed to be, u want that get a deville. Then again, you're looking at someone who daily drove his built, H/C/I/E IROC, rain, snow, or glaze ice in patches on the roads. Last edited by vampiroc; 05-17-2005 at 02:07 PM. So is it saFe To SaY That a 327 is a RacIng EngiNe??? I reaDinG this posT and I HavE agreeMeNtz and diagReemeNtz! One thiNgz foR sUre a 327 doeS soUnd DiffeRent ThaN a 350! Im noT foR sUre WhaT eLse coUld bE donE to mY 327! I havE a cAm And It rUnz gooD! I sEE yaLLs PoInt wiTh tha HigHeR RPM, BUt iS iT saFe TO SaY ThaT iTz a StokeR enGiNe BaSiCaLLy coMpaRed TO THa 350? MiNez rUnz lIKe One bUt I geT to 5 geaR pReTTy fAsT oN THa HiGhwaY! Last edited by QuIcC SiLveR; 05-17-2005 at 03:33 PM. 1) It's the "other" engine you have available. The first one is a 305. 2) You are racing in a class that is displacement-limited, and you can use a 327. Man, how do you figure? More accurately, the 350 would be considered the stroker since both motors have a 4" bore and the 350 has the longer stroke. See stroked usually means a longer stroke...destroked means a shorter stroke. The 327 might work better with your particular combination, especially if you have a traction problem, but, equally outfitted, the 350 will outpower a 327 pretty much every time. I really can't imagine where you're coming from on this, especially since you claim to have run both. I guess then a 302DZ motor would be even stronger than a 327 by your logic. By the way, your shift key is all f'd up. Hey vamp, if you consider the 302DZ motor a torque motor, your just showing a lack of experience with SBCs. Half the restored 67-69 Z/28s out there have 350 cranks in them because the 302 is such a turd in traffic. Some of you drag strip heros really crack me up. "With overdrives you can run 4.10 or 4.56 gears". Hell man, I drove a 440 sixpack superbee with a 4 speed and 4.11 gears everyday for years. My 69 camaro still has 4.10 gears and a 4 speed, and I consider it pretty tame. A real economy car. Oh yeah, and I just got passed by a "single digit" 307 on my way back from lunch today....har har har...and since it had a tag, it's 100% streetable and absolutely no hassle to drive...har hee haw.. You're killin' me man.... Har har har ho ho hee har har. More like the gene pool needs some chlorine. I'm getting really close to carrying out my threat to clean up this thread of all the non-tech opinions and chatter. I hate wasting my time on stuff like that, but you have been warned. Man, how do you figure? More accurately, the 350 would be considered the stroker since both motors have a 4" bore and the 350 has the longer stroke. See stroked usually means a longer stroke...destroked means a shorter stroke. , but, equally outfitted, the 350 will outpower a 327 pretty much every time. I really can't imagine where you're coming from on this, especially since you claim to have run both. I guess then a 302DZ motor would be even stronger than a 327 by your logic. Last edited by QuIcC SiLveR; 05-17-2005 at 04:28 PM. "If you truely want a fast car "streetability" in your terms is pointless. A fast car will not be an easy to drive, relaxing cruise; it's not supposed to be, u want that get a deville. " That's a little bit unfair and not entirely true. Who says you can't have a fast car and streetability at the same time? A perfect example is my 1968 Firebird, which has a 465 cubic inch Pontiac motor in it. The engine has so much torque that even the non-ideal 3.08 gears in back feel good. And it's a solid 13 second car, yet it cruises beautifully. I know, 13 seconds to you is probably NOT a fast car, but in Colorado it sure as hell is! Up here at over a mile in altitude, not even the Z06 Corvette can easily break out of the low-14's. The thing about cubic inches is, the more cubes you've got, the easier it is to get a fast car without sacrificing streetability. The 327 seems to be just below that water mark, torque-wise. You're right, put 4.11's behind a 327 and a nice double-overdrive 6 speed transmission, and it doesn't matter. But have you priced those options lately? A rebuilt stronger differential and 6 speed transmission can easily cost as much as an entire trick 327 would cost to build! So if you're gonna spend that much making a 327 fast as well as improve its streetability, then why not just have the cubes and build something that can do it both? Like a 350, 383, 377, or 406? Or maybe even a stroker 400, like a 421? With enough torque, you can make a car fast and streetable at the same time, and the point of the post was that it is hard to cam a 327 up nice and still have any usable torque down below 4000 rpm...which I agree with. I had one of those 327's in my 68 Corvette originally. People don't give TORQUE enough credit. It's all about horsepower to some people. But you CAN'T have horsepower without good torque, and better torque only makes you quicker. By the way, a Pontiac 455 engine is close to the same size as a small block Chevy. So we're not really talking apples and oranges. Cubes are cubes, and more cubes in a small package is a good thing. In my humble, respectful opinion, anyone who says that drivability is not important has never had to deal with a car with poor drivability. Even the guys running for the money want a car that goes straight and makes the number with the least possible hassle. Yanking the old distributor and coil out of my camaro and replacing it all with MSD stuff made for a huge improvement in drivability, though it probably didn't gain me a tenth in ET. Now the car will loaf through a school zone in high gear, where before there would be no way without the car bucking and jerking against the cam. Why is nitrous so popular? Because the power is there when you want it, but you don't have to deal with a 500hp slobbering tempremental hog of a motor everytime you want to go hang out. One of the best engineered street cars I've ever been around ran 8.70s and did it like it was driving to day care. I'm mentioning all this in support of my opinion that, by virture of superior drivability, which is the result of greater torque in a given configuration, the 350 makes more sense in 99% of applications than the 327 does. disclaimer: I've never run a 327, and I've only even seen one, in an impala, in the J-Y. but here's my thoughts, from one dumbazz to the group. a 327 is cool. it's a motor not everybody runs, and can be a great way to make your car stand out. it sounds good (apparently, i don't really know) looks cool in the engine bay, and it's bigger than a 305.
but a 350 is bigger than both. it sounds different, but will make more power if both motors are built the same. it comes down to this: how fast do you want to go? if you want to stand out and be different, but don't care so much about tweaking that last 10th out of the motor, sure, go 327. i'll still gawk and admire the work because it's not something you see everyday. but if you wanna go faster, easier, and more efficiently, go 350. You may agree, but you'd be wrong. Built the same, the 350 will always make more power. The RPM for the peak torque & power may be higher for the 327, but the peak torque and power will be higher for the 350. Guys, what you've heard won't change physics. Get it through your thick skulls. If that seems harsh, so be it - the whole purpose of this thread was to dispel the stupidity such as was just stated. It don't happen, it ain't gonna happen, so stop saying it will. 2000 RPMs due to nothing but a 1/4 inch less stroke - give me a break. I know that with the same 4 inch bore the horse power levels will be similar. Depending on how its built, the 327 will give up about 30 lbs of torque to the longer stroke 350. It really doesnt matter at what rpm a 327 or a 350 makes power. If they have an identical build, say your 327 is making 325 hp at 3500 rpm, the 350 will be making the same hp or more, but torque, say your 327 makes 350 lbs of torque at 3500, the 350 will be making the same torque at 600 rpms lower. an just in case you didn't see it once, again. somebody who actually put a 327 in their car should post on the results. Having personally compared both a 327 and a 350 in my '68 Corvette, I can attest to the stronger performance of the 350, despite a half point lower compression. In fact, this 350 was so good, it still resides in my IROC-Z today. ...If I had a 327 in good shape, I'd probably use it, but only in a very lightweight car. I think the Corvette's 3200 pounds was a little too heavy for that engine. It would have been a nice engine in a 2800 pound or lighter car with steep gears. Like a converted 240Z for example. But these guys are right. More cubes equal more power, generally speaking. To me, the main reason for destroking an engine and installing long rods is if you're going to race it and you want the cubes with lower piston speed. Still, for the street, torque is more important than horsepower. The recent premise was you build a 327 and a 350 the same. If that's the case, the 327 will lose. If you build a 327 to make the same power as a 350, then you aren't building them the same, are you. Even then, if you build them to obtain the same peak power, you won't get the same peak torque (and vice versa), and the 350 will still have the advantange of more "area under the curve" - i.e., more torque over a broader RPM band, which means more power over a broader RPM band. The formula for HP is (torque x RPM)/5252. If built otherwise identically, the 350 will always have more torque at a given RPM, therefore it will always have more HP (unless the setup is built to max out the 327). If built identically, the RPM at which the peak occurs will be negligible, although the 327 will probably be slightly higher. Regardless of where the peak occurs, it means you have to rev the 327 higher to get the car moving, rev it higher to accelerate the car at the same rate as the 350 would, which means the 327 will not be able to sustain the acceleration and will lose. I've had a couple 283's, a 302, a 305, a 307, a 327 (several others in the family), a few 350's, and a 400, all SBCs. The only two that were built "identically" were a 283 and a 327 - same heads, cam, intake & carb that were on the 283 went into the 327, although the 283 had flat tops and the 327 had dished pistons. The carb was too small for the 283, so the 327 was really choked, but the 327 still had more power - it really woke up when I put a q-jet on it. Know why nobody has come forward with data on identically built 327 & 350? Because the result is a foregone conclusion to those who understand basic physics and/or those who don't have money to flush down the toilet. Hello! if there built the same the the 350 will always come in on top. Boy, this is one lo-o-o-o-ong thread and I'm glad for it. I just acquired an '82 Firebird with a 2.8 V6 rotting in the engine bay. I just happen to have an early small journal (forged crank) 327 and a 4-bolt main 355 lying around doing nothing. I'll probably go with the 355 because bigger is usually better and I only have money to build one of them up. Then again, many many posts back, someone mentioned the very special sound of a high-revving SBC. Maybe I need to buy another Firebird to even things out. But since where off the subject, I would build an engine using the bore of a 400 small block, but combine that with a 3 inch stroke. Of course it would be put behind a stick shift. It would rev to 7000 or more. But since this is 327 verses 350 I would say my favorite 327 would be the 350 horse 327 found in the vette. My favorite 350 would be the LT-1. 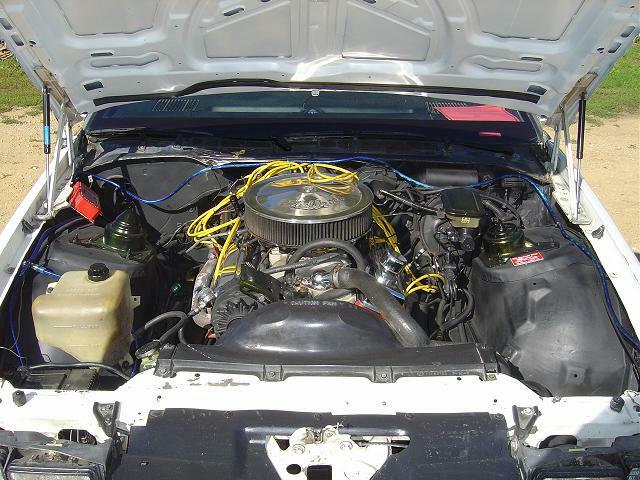 i have the L79 327 in my third gen, only upgrades are edelbrock headers, edelbrock 750cfm carb. i will tell you, that eats 350s for breakfast, havnt had much that could or woudl keep up. the only cars that keep up are big, big money cars. i wouldnt traid my 327 for any small block. 84327 your dead on. There are but a handfull of cars that had hypo 327s. The L79 is but a few, I beleive the L84 fuely is the 365 hp(Gross horsepower) L65 is the carb version. But there are just a handfull of hypo 350s also the LT-1 370 hp 360 hp in the camaro, I belive the 1st hypo 350 would be the L46 in the 69 vette 350 hp. The L46 does have me confused though. The L46 sounds like an Lt-1 with a quadrajet and a low rise cast iron intake. It has the same 11:1 compression. i know a few gentlemen with 327s in there variouse cars and trucks, and there all the week 250horse version, none of them believed me when i told them the L79 was 340-350hp stock, one of them owns a garage, we tore the motor apart got some Numbers and checked, yep L79. then add on a big carb and open exhaust add another 20 atleast onto that. we then went out, he had his 81 Trans am with a 455 bigblock, 3.77 stock car gears, posi, i have 3.08s and one wheel wonder. well we went the local track on test day, first race he beat me by 2 tenths of a second, second race he killed me but he punched the go button (nos), but third race he ended up winning by half second. (good thing the 70's trans am with a bigblock is so damn heavy) lets see your 350 do that. Last edited by 84327power; 06-24-2005 at 06:56 PM. LT-1 (yes there is a hifan in thats not like the 92-97 LT1) Put them in the same car the LT-1 will beat it. On the street torques is KING, but not only will the LT-1 make more torque, it has more horses. We are talking vintage ORIGONAL L79 V.S. LT-1 engines. I doubt your L79 has the Origonal grind. ok yes, an orginal LT-1 vs. L79 the LT-1 will win. horsepower yes gross 350 with the L79 and 370 with the LT-1 of course the LT-1 will win. what i was talking about is a slightly modified L79, basically straightpiped true duel exhaust, with larger carb, in a lighter car, vs. a 455 heavy as **** car. O.K the Lt-1 will be quicker? Or was you saying let the average 350 do that? i was talking a LT-1 Vs. a L79 in the same car, stock motors, the LT-1 will win. but main point was that a well put together L79 327 vs. a good 455 in a heavy car the 327 should win. Last edited by 84327power; 06-24-2005 at 09:13 PM. Just got this nice L79 Pic F##### I love V8 chevys!!!! !